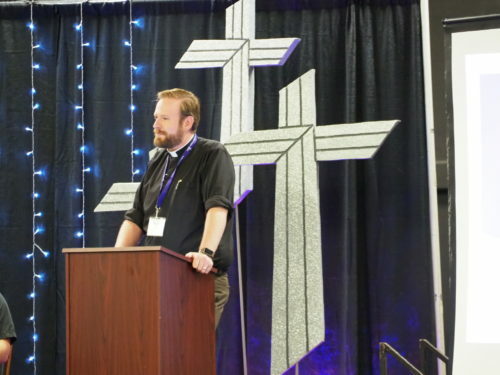 Things I Learned at the LWML Convention | "Northern Crossings"
This is Dan Suelzle the Campus Pastor at UND, Wittenberg chapel. He is being supported by the mission dollars of the North Dakota District as well as some grants from the LWML in the past. Even when some grants are turned down or reduced the LWML takes offerings at the convention to help in any way they can, One of the offerings was for Chinese language material for the campus ministry. Rev. Mark Buchop had a large Chinese contingent that he worked with for years at Wittenberg and Rev. Suelzle is continuing that outreach. In these days of racial tension and constant sensitivities to identity politics I was fascinated to learn that the LWML did something quite amazing years ago. Three years after I was born (1955) the LWML has contracted to hold a convention in New Orleans. President Lillian Preisinger, cancelled that convention because its Black delegates were refused rooms at the convention hotel. That is quite a statement especially if you have any knowledge of the expense, the planning, the preparation, and the plain hard work that it takes to plan and execute a convention of any size, let alone a national convention with delegates from around the country. The canceling of a convention at that time shows a sensitivity and a conviction that was nascent in most of the country. We have to assume that the mission mindedness of the LWML would have no truck with racism which is at heart, a denial of the Gospel. It is considered the height of bad manners to walk in front of the dias or podium or whoever is presiding or speaking at the convention. Directions were given as to how one was to circumnavigate their place in the convention to either get out or to come forward to speak or just to stretch ones legs. I have been to conventions of Pastors and watched in stunned amusement when certain Pastors answered their cell phones and carried on a long and loud conversation as they stepped on feet and moved chairs out of their way; stumbled and floundered right in front of the dais as someone was speaking. I remember a certain glare that came over the speakers face as he watched this and literally stopped talking while the miscreant finally left the hall. Had that happened with the LWML they, as the old saying goes, would not be amused. The centrality of the Word and prayer is quite amazing. Everyone gets a list of room devotions that can be used between roommates or alone. These are prepared by the Junior Counselor. In North Dakota that was Rev. Jacob Swenson. At every point and in every way the convention was designed to move the theme and “Lift High the Name of Jesus”. PreviousThey are Fun and You Learn Something Too.